As one of the leading firms in the North West, Farleys Solicitors LLP is recognised both regionally and nationally for our dedication to the outstanding provision of legal services – we pride ourselves on combining legal expertise with a down to earth approach, resulting in cost effective solutions to virtually any legal issue. 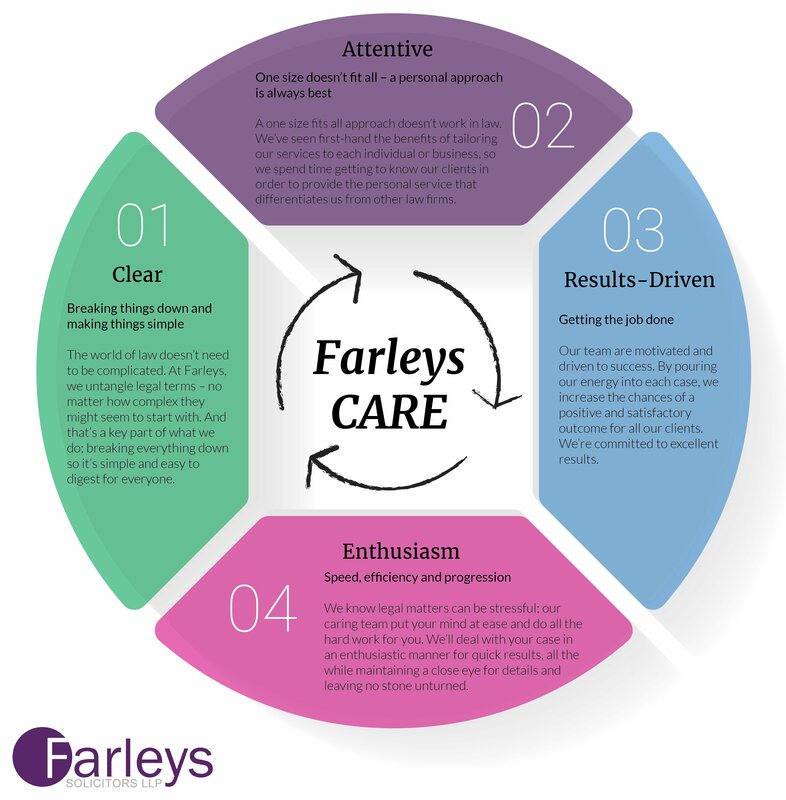 We have a set of core CARE values here at Farleys that influence, guide and structure everything we do. With CARE values in mind our team provide legal services that are clear, attentive, results-driven and enthusiastic. CARE is what sets us apart from the rest. Breaking things down and making things simple. The world of law doesn’t need to be complicated. At Farleys, we untangle legal terms – no matter how complex they might seem to start with. And that’s a key part of what we do; breaking everything down so it’s simple and easy to digest for everyone. One size doesn’t fit all – a personal approach is always best. A one size fits all approach doesn’t work in law. We’ve seen first-hand the benefits of tailoring our services to each individual or business, so we spend time getting to know our clients in order to provide the personal service that differentiates us from other law firms. Getting the job done. Our team are motivated and driven to succeed. By pouring our energy into each case, we increase the chances of a positive and satisfactory outcome for all our clients. We’re committed to excellent results. Speed, efficiency and progression. We know legal matters can be stressful; our caring team put your mind at ease and do all the hard work for you. We’ll deal with your case in an enthusiastic manner for quick results, all-the-while maintaining a close eye for detail and leaving no stone unturned. Our aftercare is one of a kind, and we regularly check up on clients to offer additional support where required. Our aim is to provide a quality assured and cost effective legal service, for all our clients; to be a practice that our clients are proud to be associated with and our employees proud to be a part of. As well as taking care of our Farleys community, we also take our corporate social responsibility very seriously ensuring we do our bit for the wider community. From organising and supporting fundraising events to offering free legal advice to the most vulnerable in our local communities. Some of our staff sit on the board of trustees at local charities and we encourage all to have a social conscience and give back to the community where they can. For more information about how we give back to our local communities, read our Corporate Social Responsibility Policy. Our own customer satisfaction surveys across our departments prove that our clients fully appreciate the common sense approach we adopt and the quality service we provide. Over 97% of Farleys clients have returned to us or were recommended by others to consult us – read what they have to say about us. Our current statistics can be found here. Farleys Solicitors LLP is a Limited Liability Partnership registered in England and Wales with number OC331793. A list of members is available for inspection at our registered office and is also shown further down on this page. We use the word “partner” to refer to a member of the LLP or an employee or a consultant with equivalent standing and qualifications. Farleys Solicitors LLP is a member of The Law Society and is regulated in the practice of law by the Solicitors Regulation Authority, Registration No: 484687.